I started knitting again when we lived in IL and found a knitting group here in VA two years ago. I came across Wendy’s Keele’s Poems Of Color on the Knitter’s Review forums when I was exploring color work and have loved those designs and the story behind them for quite some time. Last year, against all my previous intentions, I learned how to spin. That is, spin yarn from fleece/unspun fiber, not the exercise spinning, although I might be able to do that as well. For a while, knitting was touted as the new yoga – for me, the new yoga is spinning. Both are relaxing, both are hand-work that results in a physical transformation, but when it’s going well, spinning is very calming and centering. In April, Loudoun Needleworkers went to Willow Hawk Farm‘s spring shearing and I ended up sharing 4 fleeces with another spinner, Jenni, so that we could try fibers from different sheep breeds. Jenni and a few other friends skirted the fleeces (picked all of the poopy, yucky part out) and Jenni & I split washing duties. 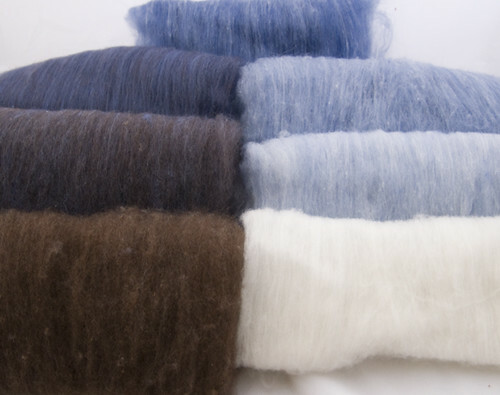 After washing, most fleece needs to be further prepared (combed, carded, or flicked) for spinning. In May, my husband gave me a Schacht Matchless wheel and a Strauch 10th anniversary drum carder for my birthday & Mother’s Day. The drum carder, by the way, is used for blending fibers into batts, which look a lot like batts of insulation, and is actually not as helpful as I had hoped at handling large amounts of washed fleece. 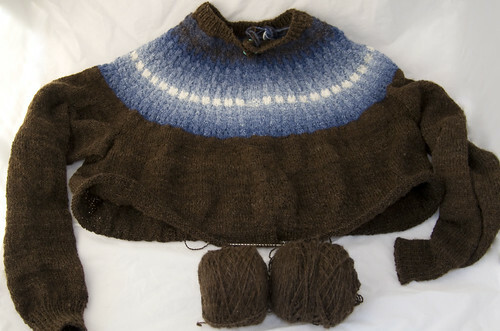 All of these things – Bohus Stickning, fleece, carding, and spinning – came together over the summer; I am currently knitting the Red Palm Cardigan. The pattern for is in Poems Of Color but I am making it in shades of blue instead of red. Another difference between this sweater the orginal bohus sweaters is that mine lacks angora, which gives the bohus sweaters a subtle halo of fuzz. 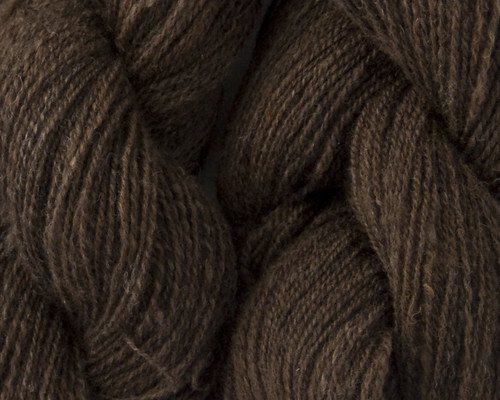 In addition, all of the yarn that I am using is handspun. 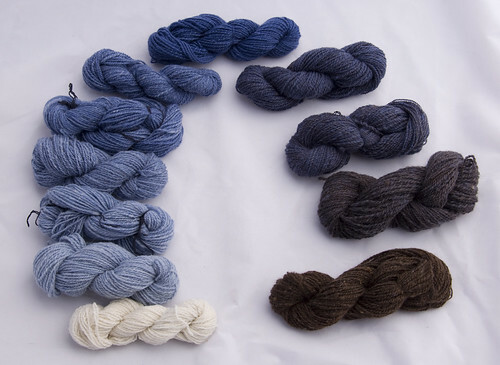 These are some of the batts that I made using my drum carder that blend the brown wool from one of the Willow Hark farm fleece from a sheep named Abigail (1/2 Romney, 1/4 Finn, 1/8 Corriedale, 1/8 Merino), with a braid of blue-faced leicester from Miss Babs in the Regent colorway (blue), and white cormo that I got from a very generous spinner during the first-ever Spinning Loft Retreat, which happened last spring as well. By varying the percentage of fibers blended, I was able to achieve some very subtle color changes from cormo->BLF->Abigail, which was really just an experiment for me as a new spinner & carder. These are all of the skeins of spun yarn that I ended up with from the carding experiment, from light to dark, with 100% cormo at the 9:00 position, 100% Miss Babs BFL at 12:00, and 100% Abigail at 3:00. All of these are 2-ply yarns, which means there are 2 strands of singles (what gets spun initially) twisted together to make the yarn. 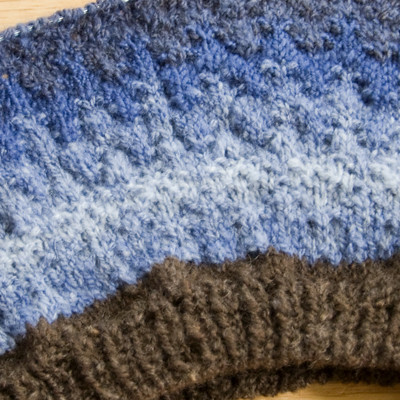 Most of the Bohus sweaters are yoke sweaters, which means all of the color work is done over the shoulders, rather than, say, near hem edges on the bottom or the sleeves or in an all-over color work pattern. They are worked from the top-down in the round, which means (basically) that you knit a starting at the neck and working your way down to the bottom hem, stopping at the armpit to make each of the sleeves. The pullovers and the cardigans are constructed the same way, but when you are done knitting the body of the cardigan, you cut (with scissors, no less) right up the front and knit a button band on. This is a steek and it strikes fear in the heart of many knitters, but I hear if it’s done properly, nothing will unravel. My first yoke that goes from dark to light to dark shades, as does the original red palm cardigan. I miscalculated the color that I needed to start with and end up frogging it (a.k.a., ripping it out or unraveling it) because I ran out of colors before I should have. My progress so far, arms and all. If you look closely at the yoke, you will see the colors go from light to dark to light as opposed to the sequencing in the original and in my first attempt. I have another 4″ or so and I’ll start the ribbing for the bottom hem. I had to prepare and spin more of Abigail, which is what I’m using for the main body of the garment. I still have more fleece, but here is a closeup of the 3 additional skeins (about 1416 yards total). As you can see if you look closely, this is a 2-ply yarn as well. I’m hoping to finish this by the end of next month so that I can wear it while it’s still cold. I am able to carefully try it on, so I know it will fit. At this point knitting, particularly with this project in the all-stockinette stitch stage, is so easy that I can do it without having to look at it most of the time, which means I can do other things (like watch TV/movies) while I knit. So, uh, that’s what I do when I’m not digging up the past in writing, poking around on etsy, or keeping up with my suburban mom gig. Oh! Here’s the project on Ravelry (for you ravelers out there) and the complete photoset on Flickr. My wife just took up knitting. She took some lessons…..Your sweater looks great! Making things is so satisfying!